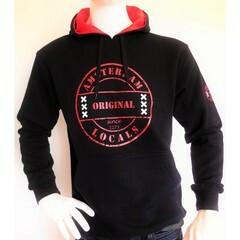 Home Ladies Tops & Sweaters Ladies & Sweaters Amsterdam Locals. Ladies & Sweaters Amsterdam Locals. Ladies Sweaters Amsterdam Locals . Choose your favorite sweater. Different models fleece sweaters. Proceeds will be donated to cancer research . We providence Different models sweaters. Ladies Sweaters Amsterdam Locals. Amsterdam locals stands for fashion, fair, sustainable and social. Choose your favorite hoodie or sweater. We provide different models of sweaters and hoodies, prints and fabrics. Our fleece sweaters and hoodies are lightweight, very soft and warm. The fleeces sweaters are strong, durable and made of waste PET bottles. Fleece hoodies do not shrink, fade, and is light weight and therefore comfortable to wear, and really warm. We donate the proceeds to medical research.